Siemens Medical Solutions (Erlangen, Germany) has announced the formation of a new division, Image and Knowledge Management (IKM), which combines several information technology groups, including the computer-aided diagnosis (CAD) group. Applied Radiology spoke with Alok Gupta, PhD, MBA, Vice President of Siemens' Computer-Aided Diagnosis and Knowledge Solutions (Malvern, PA), about the change and the state of CAD technology in the United States. Applied Radiology: Why was the new IKM division created? Alok Gupta: At Siemens Medical Solutions, we have a long-term vision that the data and knowledge contained in information technology¨C¨Csuch as patient data and clinical knowledge¨C¨Ccan help to improve quality and manage costs of healthcare because they improve the efficiency and accuracy of clinical processes. The IKM division was formed by combining 3 Siemens businesses: radiology information system (RIS) and PACS; syngo software platform; and the CAD group. Each of these groups were looking at different knowledge management and intelligent data processing and image processing activities. Combining these businesses shows our commitment to strengthening these technologies. AR: What are the main goals and objectives for the CAD and Knowledge Solutions group? AG: We were formed 4 years ago to look for information and knowledge around clinical processes that can be brought together in applications that are used across the patient-care continuum to include early detection, accurate diagnosis, therapy decisions, and follow-up. These applications must be integrated in our overall product portfolio. For example, our applications are seamlessly integrated into our PACS and multimodality workstations. AR: Which products are in this group's portfolio? AG: Our group includes anything related to CAD, ie, colon polyp and lung polyp detection applications. This group conceived them, did the research, did the laboratory premarket approval (PMA), and brought them to market, including integrating them into the application. AR: One new product from Siemens is the syngo Lung CAD. How is this different from the previous product, syngo LungCARE NEV (nodule enhanced viewing)? AG: The syngo LungCARE NEV is a first-generation product that it is em-bedded in the clinical application syngo LungCARE CT (computed tomography), which offers a workflow that is a first step toward our CAD product. The syngo Lung CAD (Figure 1) is a generation beyond NEV. It has gone through clinical testing and validation through the PMA process, and we have published clinical results and claims. AR: What is the minimum nodule size that syngo Lung CAD can detect? AG: The product has been validated in our published results for solid nodules 3 mm. We chose the lower nodule size limit with the intention that radiologists will institute their own cutoffs based on clinical context. AR: What other CAD products does Siemens currently have on the market? AG: The syngo Colonography PEV (polyp-enhanced viewing) is embedded in our syngo Colonography application. This is a complete colon examination application with 2 added features: detection (with identification and magnification of the polyps or polyplike structures) and measurement of the structures. We also have a product in echocardiography, syngo Auto Ejection Fraction (EF). It can be used to automatically detect and track the heart walls in the very difficult scenario of cardiac ultrasound. The system can quantify several measurements automatically, including EF. We also have a separate product called syngo TrueD, which is a complete application for evaluating therapy response. We can look at longitudinal studies using positron-emission tomography (PET)/CT from mulitple time points, and we can combine them with complete support for registration, mapping regions that correspond, and quantitative tabulations. AR: Which other CAD products are in development? AG: The syngo MammoCAD is under PMA review and is not yet available in the United States. We have a product for pulmonary embolism detection or filling defect detection that is also in review. AR: In what direction do you see CAD going in the future? AG: In oncology, we are targeting more specific diseases and organs, but we are also looking at what I call " whole-body" CAD. CT, magnetic resonance imaging, PET, and single-photon emission computed tomography collect a lot of data, and getting through that data is increasingly difficult, especially if many areas are to be examined. So we are focusing on whole-body CAD with CAD tools for navigation and disease detection. 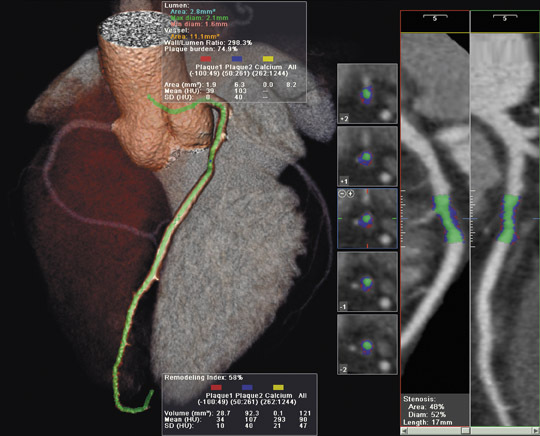 AR: Do you believe CAD will move beyond detection and toward disease classification? AG: We are taking a very broad view of that. I would say it's moving more toward diagnosis. In fact, we are not just looking at images. We use images as one source of information. When you need to characterize a lesion, we believe that you need more information. You need to also know the clinical history of the patient, other laboratory tests, blood data, and, potentially, genetic information. Our concept is a little unique in that we look holistically at all relevant data that go into diagnostic determinations. Because we are talking about a decision aid, we can essentially present a doctor with a certain probability of a certain disease so that the patient management can be directed in a certain direction. Our concept is broad, including all this other data, and we are working on several areas in oncology and cardiology to look at disease as disease, not just as a single modality. AR: What are the major obstacles to the development of new CAD products? AG: If you try to build products in this area, there are limitations on the technology of how accurately one can carry out a task. There is only a certain degree to which you can solve the problem. Given that technical limitation, the primary driver for developing CAD is the availability of high-quality ground-truth data. CAD systems are specifically trained from evidence-based prior data. This data must be very high quality and comprehensive, and it must provide enough background information so that you can validate a CAD system completely. Before you put a CAD system on the market, you must know quite well that it will perform to its specifications in an unknown clinical environment. That data is the fundamental heart of building CAD systems, and you must have confidence to build the right algorithms. AR: How hard is it to gain the acceptance of physician end-users? AG: When products truly help physicians sift through large amounts of data, they must be integrated almost seamlessly into the workflow. I cannot ask a physician to go to a second workstation to use CAD. But if CAD is available in the right place in the PACS environment where they do their reads and it is only 1 or 2 mouse clicks away, it will overcome the acceptance hurdle. AR: Is reimbursement an issue? AG: With products that relate to a large quantity of data that try to increase accuracy and efficiency, the systems have to be embedded in the workflow in such a way that the value for the doctor or the practice is that they are able to increase patient throughput. So while the CAD systems may not increase reimbursement directly, the argument should be that they should use CAD because it improves overall efficiency. AR: What would you say is Siemens' view of the future of CAD? AG: The difference in the way we view CAD at Siemens is that we look holistically at all data. That is really how we see the future, that we have to look at diseases and all data that is relevant to diagnosis. Technology and Industry¡ªComputer-aided diagnosis: An interview with Alok Gupta, PhD, MBA. Appl Radiol.